My journey of discovery to uncover the bloom of the new surge in independent gin distilleries in the south west has been full of surprises and has far exceeded my expectations. 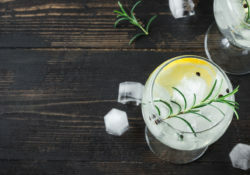 The growing popularity of gin as a beverage by the public has led the spirit to become, once again, ‘on trend’ and in recent years we have seen the birth of many new, pioneering distilleries. These have given a new lease of life to an industry that had become stagnant; awakening the dormant creativity and entrepreneurial spirit, yet at the same time retaining the important roots of the industry. My research showed me how the smaller distillers have used more established companies as role models. Plymouth Gin for example, with its historical heritage as much as the standards it sets. The standards become the new distillery’s own benchmarks to achieve a quality product. The popularity of the more established distilleries, namely Bombay Sapphire and Plymouth Gin may be coined by some as competitive, but it seems to me this is less rivalry in context and rather more beneficial for both big and small distilleries. Both their productions work hand in hand to bring voice and recognition to the industry. At the same time, it allows for standards to be raised in both production and quality in our century. I believe too, that the growing number of smaller distilleries has allowed the gin industry to become more diverse. This diversity importantly provides each distillery with its own voice and vehicle for expression: of its locality, the makers origin, and palate. ‘Conquer Gin’ was one of the first companies to use samphire, which is an ingredient long forgotten, together with gorse flowers foraged from its local area, the New Forest. On the other hand ‘Pothecary’, with its distinctive floral palate, uses organic and wild foraged botanicals from different regions to express the creator’s visionary palate. These new breed distilleries, whilst placing emphasis on innovation and excelling in this aspect, have still retained and upheld the traditions and standards set long ago. Thus the three main elements that bring our attention to the renaissance of these new breed distilleries I would categorise as: the innovation, the production and the tradition. These aspects make it an exciting time for gin production and the industry in the south west. The injection of the entrepreneurial and creative spirit of these individuals bring a new release of life to the industry, and I thoroughly believe place the southwest of England on both the national and worldwide map, allowing for the recognition of its contribution and excellence. In recent months we have seen Tarquin’s Seadog Gin awarded the best gin in the world. I believe there is much to look forward to and plenty of scope for the visionaries and alchemists of the gin industry. The second part of my gin journey will take me towards Bristol, ‘Urban Distillery’ and the single estate distiller Chase, where I will continue to look at the diversity and variety in production. I believe that now is an exciting time for all in the industry and the general public who are able to witness a new evolution in the gin industry and experience the joyous revival of a passion for flavour and tradition. Stepping out onto the tarmac of Gate 01 at Glasgow Airport, our plane was awaiting. This would be my first time on a prop plane, so, of course, the novelty deserved a quick pic and post on Facebook. Thirteen of us – me and my fiancée Shelley, and 11 lively Americans – took off after a quick headcount was conducted. With only one or two glimpses of land on the 30-minute flight, we suspected the weather in Islay was not going to be particularly balmy. Indeed, when we landed in the extreme drizzle, and promptly collected our rental car, we were told it was not unknown for the plane to head back to Glasgow in similar conditions. Thankfully, it was off to my first scheduled distillery visit 30 minutes later – Bowmore at 1.30pm. After a hard introduction into Islay’s roads in the increasingly-heavy rain, we approached the lovely, whitewashed village of Bowmore. Down the wee hill and left at the junction, into the grounds of the Bowmore Distillery. I spent a couple of hours with Dave and Brian who showed me the day-to-day workings of a famous distillery. Admittedly, I felt a bit like a fish out of water upon arrival; I was, after all, walking into the middle of a hard-working day, and trying my very best not to interrupt it. Before long though, I was becoming familiar with the operation of the mash tun and the underback, the various stages in the named washbacks, and the change from the sugary wort into the foamy wash. All these are things which I had a lot read about, but seeing everything in situ was a whole new experience. I was shown the Porteus mill – the machine which operates so impeccably, the company who manufactured it went out of business in the 1970s. I visited my first still room (which, as I had previously learned, was very hot! ), the malting floors, and the various levels of their dark, cold and old warehouses, as if I were inside the PR imagery of their famous No.1 Warehouse. On to the tasting, and my first conscious exposure to a word which is now part of my everyday vocabulary: dram. Four drams, and a wonderful introduction into the week ahead in Islay. Fruity notes, subtle smokiness (at an Islay-lowly 25ppm), sherry butts, bourbon barrels, cask strength, new, old – Bowmore showcases a wonderful and ‘accessible’ range of Islay whisky. My favourite: 15 year old (was ‘Darkest’). A rather full-on experience during my first few hours in Islay, and a highly enjoyable tasting, ensured an appetite was well and truly worked up. After checking in to our accommodation, it was off to the nearby Harbour Inn for oysters and mussels! We were staying in the tranquil village of Bridgend, eight minutes north of Bowmore along the coast. A 20-minute drive northwest from here, half of which was on single track road (and me trying by best not to be distracted by the views from the west of the Isle), lead us to the newest and only privately-owned Islay distillery, Kilchoman. Over the course of 90 minutes, I was shown around the different areas of the distillery by the knowledgeable tour guide Cherry. Now more familiar with what the machines are and what they do, including the fabled Porteus mill, I was able to compare and contrast the various stages of the whisky-making process with those of the much larger Bowmore (200,000 litres per year vs. Bowmore’s 1.3 million). This was a great little tour, in an intimate setting, where I learnt more about the entire whisky-making process – from the harvesting of the barley, to the bottling of the final product – Kilchoman do all of it to some extent on their own premises. Still not quite old enough to produce a 12-Year-Old (their first production was in 2005), I was treated to a flight of five Kilchoman drams with differing cask finishes, plus my first ‘100% Islay Barley’ whisky during the tour. All of them had more of the classic smoky, peaty notes I had associated with Islay whiskies (except the 100% Islay, which has a much lower phenol content than the others; 15-25ppm vs. 50ppm). However, they were all supported by lots of fruity undertones, some with light citrus, moving on to richer orange and cherry notes, and then to banana and pineapple, with hints of hay, and a bit of a rustic character, which I think gave a real uniqueness to these whiskies. Back on the road, retracing our steps back along the narrow road, we made a right at the junction for a short drive south to Bruichladdich. Instantly, it is clear this is a distillery who like to do things slightly differently; a distinct teal-blue colour, and the words ‘progressive Hebridean distillers’ give the impression of a forward-looking business. This is further endorsed by the slick visitor’s centre, within which a wall is dedicated to their chic gin brand, the Botanist. As much as I love gin, I was here for the whisky. 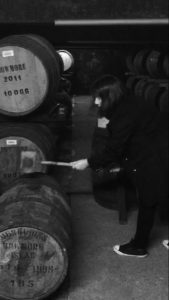 Just a quick guide – situated in their cool warehouse among barrels bearing names from my WSET revision notes: Rivesaltes, Mouton-Rothschild, Burgundy, Syrah – in which we tasted three completely different incarnations of their whisky. The first, a cask dating back to 1989 – older than Frazer hosting the tour – was a classic Bruichladdich, which means unpeated! It had spent the first 23 years of its life in an undefined bourbon cask, and was then rejuvenated by being added to a fresh Jack Daniels barrel. It was one of the mellowest, lightest, easy-to-drink whiskies I tried on the entire trip. The next dram was from the 2004 Mouton Rothschild barrel. This time the liquid was a Port Charlotte, Bruichladdich’s ‘heavily peated’ range, at 40ppm. Again, it had spent a lot of time in ex-bourbon barrels before being finished in the Bordeaux wine barrel. Vibrant, fruity, and slightly tannic – very elegant. Finally, the 2005 barrel which contained Octomore. This is their ‘super-heavy peated’ brand, up to a whopping 250ppm. Despite this very high number, the whisky itself is nicely balanced between the smoke, herbal tea, and rich vanilla-toffee notes. I suspect this has something to do with the fact the peat used is from the north of Scotland around Inverness, where there is a much higher wood content compared to the peat from Islay which is highly vegetal and gives the more seaweed, TCP and iodine notes famous of Laphroaig. No other distillery I visited had such an array of old barrels in their stocks (over 200 different styles). It’s safe to say, I did not leave Bruichladdich disappointed or feeling oversold by their bold statement upon arrival. We packed our bags early and headed to our digs in Port Ellen for the second half of our stay in Islay. This was to set us up for visiting the nearby Ardbeg and Lagavulin distilleries, but not before spending the entire day at the legendary Laphroaig. 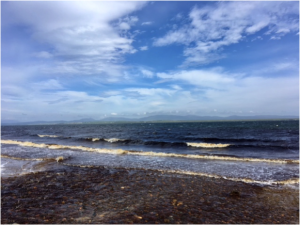 The day started in glorious sunshine – a warming incandescence over the undisputable beauty Islay beholds – before promptly returning to the drizzly weather which proved to be a common theme of the trip. Nevertheless, I enjoyed an immersive and thoroughly rewarding experience with my pre-visit Scotch favourites. The day started with a tour of the distillery, and I was now at a point where I could anticipate what was coming next, and begin to wonder things like how many washbacks they have, or what ppm they peat to (50-55). I visited my third malting floor (the only other four distillery-housed floors in Scotland located on the mainland), walked into a charred kiln, discovered the difference between Islay peat and ‘regular’ peat (and the advantages of hand-cutting vs machine cutting), understood even more the job of the underback, and the ins and outs of the whisky safe. I was starting to consciously piece together how each step in the process can affect the final product. Along with the type of peat and to what extent it is used, it seemed to me the next obvious difference is in the magical process of distillation. Case in point, the lyne arms on Laphroaig stills do not angle downwards like others I’d seen, which results in the denser, less volatile aromas generally not making it as far as the condenser. Instead, these ‘feints’ are redistilled with the next wash (along with the volatile ‘foreshots’), and the resulting new make spirit possesses a light but powerful profile which is instantly recognisable. The second half of my day was shadowing the production with the very welcoming Billy and Sean (whose dog Shortie, as it turns out, became the famous mascot of the neighbouring Ardbeg distillery!). I stayed and monitored the progress of the mash tun and the various washbacks. I investigated the procedures of the still room in closer detail, including the precise numbers involved with foreshots and feints, and what pot ale and spent lees are (and what they do with them). I also visited the filling room, where I made my mark on the production process by hammering in a bung into a just-filled barrel – I could barely contain my excitement! 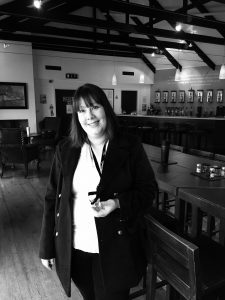 Without a doubt, spending time at this wonderful distillery – embracing its history and legacy, and getting to know the fantastic and justifiably proud staff members – increased my own passion for Laphroaig and the Scotch industry altogether. During my visit, I tasted the flagship 10 Years Old, the intense Cask Strength (batch 009), the sublime Quarter Cask, the rich and dark Lore, and the current festival offering, Cairdeas. After leaving with a couple of bottles, and a big smile on my face, it was back to Port Ellen, to the Ardview Inn, and on to SeaSalt Bistro. Bittersweet. My last full day on Islay. However, two great distilleries to visit. After the full-on experience at Laphroaig, I was looking forward to a couple more fleeting visits. A particularly grey/white drizzly morning. This may have ruined anywhere else, however, against the beautiful backdrop of the whitewashed Ardbeg distillery and its surrounding rolling hills, the rain didn’t matter. The morning tour kicked off on the pier, across from the symbolic ‘ARDBEG’ logo adorning the side of the sea-facing wall of the distillery. Having been regaled of its mixed but ultimately healthy fortunes over the years by the friendly Emma, we were quickly shown all the parts of the distillery I had become so familiar with during the week, such as: there is no Porteus mill here – instead, the equally reliable but even more antiquated Robert Boby mill; all barley is brought in, at a peat level of 60ppm (higher than Laphroaig, but less noticeable due to the distillation method); five-ton mashes; wooden washbacks, not stainless steel; and so on. A uniqueness of Ardbeg is their purifier coming off the lyne, collecting all the heavier congeners which, much like Laphroaig, is omitted from the final spirit and instead re-distilled with the low wines. However, Ardbeg’s foreshot run is only 10 minutes compared to Laphroaig’s 45 minutes, which gives more of a sweeter, estery spirit, hence the smokiness is slightly more subdued. On to the tasting. Ardbeg’s staple 10 Years Old, the basis for all their expressions, is complex and full of vanilla, smoke and a sweet citrus note. The Dark Cove had fruitier, PX influenced flavours – delicious. Uigeadail (the name of their water source), is cask strength, and has a powerful kick but a long, complex finish. Supernova (which includes space-aged components!) is super-peated at 100ppm – spicy, smoky, vanilla, banana. Last but not least, the highly complex Corryvreckan, which has peat, cherries, blackcurrants, sweet spice, and seaweed. A highly enjoyable tasting; everyone left feeling a little giddy! This visit was simply a sensory tasting session, for which I couldn’t have been happier. Not knowing too much about these whiskies beforehand – probably only the name – I was in for a tasty surprise. The host was Marjorie, whose dulcet Islay inflection provided an enlightening and captivating background to Lagavulin and the rest of the island. Marjorie passed each of us a box of five small samples of whisky, together with seven jars of aromas which we had to pick out in the corresponding whisky samples. Although possessing the classic peaty notes of a typical Islay, there was a degree more richness and body to their spirits than Laphroaig or Ardbeg. Their flagship 16 Years Old was a great start. More oily and full-bodied than certainly their neighbours’ whiskies, there is a real depth of flavour – the peat is specified to 35ppm and comes across more earthy than overly smoky, and the sherry-cask finish provides some dried fruit notes. I discovered the richness is in part due to the relatively low cut to feints and smaller stills, which means more of the oily, denser congeners are able to make their way into the final spirit. We tried a double-matured Distiller’s Edition which was so rich, fruity and moreish that I had to buy a bottle afterwards. We also sampled their 8 Years Old, the Lagavulin Jazz, and the Lagavulin Feis. 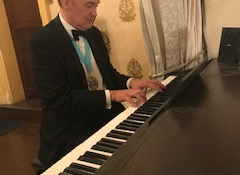 By the time we’d got to the Jazz, the room which was at first a little restrained and timid was now buzzing with chitter-chatter between Russians, Germans, Americans, and British – all good fun. I left Lagavulin with a bottle of the Distiller’s Selection, and a concluding sense that, although there is something of a connection between the Islay distilleries I visited and the whiskies I tasted, none of the distilleries and their whiskies are the same. They each have their own little quirks and way of doing things which means the resulting whiskies all have a unique character and are as great as each other in different ways. To make sure of this, I headed to the pub to try a dram from Coal Ila and (two) from Bunnahabhain (who, for the sake of completeness, peat to 30-35ppm and 0-2ppm, respectfully), and, yes, they are definitely different, and all wonderful! Little girls dream of becoming ballet dancers and singing on the stage, but what do big girls dream of? Running away from the nine to five, to hop across to an island and become a Distiller or Master Blender would be a dream come true. 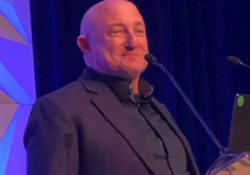 The super powers of people like Jim McEwan, Master Distiller for Bowmore and then Bruichladdich or Rachel Barrie, Master Blender for Bowmore have had me held in awe most of my adult life. You can imagine therefore that when awarded the Worshipful Company of Distillers award there really was no alternate spirit to head off to study than whisky and no alternative destination than Islay. The island itself has a magical pull to it, photographers showcase the wide array of colours from peat bog, bay, harbour and beach. Simple quirks like Bowmore’s round church – built without corners for the devil to hide in (so he headed back to the mainland in a whisky barrel of course) invite conversation and capture the imagination. The wee airstrip that’s only accessible if the weather allows and indeed the challenges of ferry crossings in the rough seas add to the feeling that one is very lucky to get across to visit. The food in Islay deserves another honourable mention with fantastic seafood, locally caught, a difficult part of the trip was choosing which whisky to have alongside. Yet of course the whisky and its people are what makes it most unforgettable in the end. Terroir is a question often asked with regards whisky and Islay has been held up by many as an example of how place affects product. A challenging concept to get to grips with as terroir in the wine sense makes sense – the soil, grape, weather all are hugely influential in the final product and style but with whisky I’m not sure everyone is convinced. A quick look over the whisky making process itself highlights the limitations of the concept of terroir. First, we take the barley – the key is to turn its starch into soluble sugars and then alcohol. Soak for a couple days, spread it out over the floor and turn regularly. Traditionally then a peat influence can be detected with the peat fuel fired kiln drying the barely out, stopping germination and producing the ‘malt’ to be ground. Those with a mind for place will argue at this early stage even the barley itself is influential with Bruichladdich now offering barley differentiation – unpeated, peated, super peated. Organic, green, bere are differentiated with mention of the altitude affecting ripening. I also loved the story of Ardbeg’s pagoda chimney not working and the effect on the malted barley from higher PPM. Next up this ‘grist’ is added to warm water – another nod to character here with minerality of water having a potential affect, and stirred for hours in the mash tun. Wort is the sugary liquid extracted from the mash tun, waters passed three times at higher temperatures to extract as much sugar as possible but only the first two runs are used. Fermentation occurs generally in the wooden washbacks with yeast added to the cooled wort to turn the sugars to alcohol. 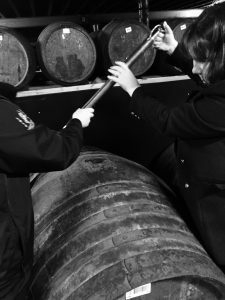 There is a small chance of arguing the type of yeast may influence the final flavor and indeed the wooden vessel usage as opposed to stainless steel – Ardbeg for instance switched back to wood not liking stainless steels effects. The end wash is a beer or ale that’s then distilled. Distillation occurs, twice traditionally, in copper vessels (best for extracting the nasties) with bulbous bottoms and long necks, fatter rears make for fuller spirits and longer necks give lighter characters. The still is heated, generally with steam, and the first vapour that condenses off is the low wines. Low wines then pass through the smaller spirit still, the foreshots and feints are redistilled with the next low wines, but the heart at 65/70% ABV is where we will make whisky. Maturing this ‘heart’ in wood for a minimum of three years is the legal requirement for Scotch whisky and there are lots of key factors to consider in this stage regarding character. Wood ‘breathes’ and to that effect Dunnage style warehouses by the sea and likely to impart far more character on the spirit than modern warehouses in the middle of an industrial estate. Indeed, the wood choice itself imparts its own flavour and aromas to the spirit. What struck me most about Islay was the tradition and the rich history of each distillery, the ties to each other and the generations of families involved with individual distilleries. The ideal of sharing warehouse spaces with each other, keeping a few casks dotted around in case, god forbid, something should happen at home. Tour guides spoke of their great grandfathers cutting peat or turning malt floors, of the amazing potential for progression from Warehouseman to Distiller, the investment of time and energy that individuals give to their industry really struck me. Hospitality is a guest-centric business where the needs and expectations call out to be met daily and on Islay that same dedication and passion is found in the approach to the whisky. If we look at terroir in the sense of tradition focusing on people, processes and equipment then I really believe that it’s easier to argue a case for Islay. Kilchoman is a great example of a new distillery drawing on the older traditions to maintain for example a malt floor. How we finish whisky, store, blend, marry and the importance of Distiller and Master Blender are key factors for me. Bowmore had some amazing whisky coming out of interesting wine casks, Bunnahabhain also felt more driven to producing malts of distinction rather than unpeated, ready to blend versions. Lagavulin’s warehouse tasting had me in my element but Bruichladdich was my favourite stop on this visit. Bruichladdich’s passion is hard to describe, but completely infectious. A distillery that whilst opened in 1881 was closed for far too long. Terroir is their cheerleaders chant, everything comes down to place – water source, peat, barley all traced, noted on bottles and there are results demonstrating nuances after only two years. Whilst the science geek in me remains a little unconvinced I’m certainly coming back for more to see how the finished dram tastes.